are much in demand in the corporate world, where they enhance and brighten a reception, restaurant or office area and can reflect the corporate identity of a business. Whether you want something to complement a contemporary, minimalist environment by using bright vibrant colours, or something more classical, fresh flowers provide a positive first impression to your visitors and enjoyed by staff members. Time for flowers has the experience and expertise to advice on design of floral arrangements, best suited to your specific office environment. Consideration is given to the height and size and attention is paid to details, such as selecting subtle scents for restaurants, avoiding flowers which might trigger hay fever allergies and taking care with the positioning and selection of flowers whose pollen-laden stamens may mark garments. 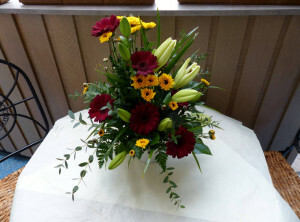 Fresh flowers or creatively designed arrangements are delivered weekly. Sourcing seasonal and local flowers ensure better value and excellent displays.